Located throughout western Virginia and West Virginia’s Eastern Panhandle region, the Shenandoah Valley is an Appalachian valley region that serves as a popular cultural and tourist destination, offering a variety of outdoor recreation activities, scenic drives and trails, and retail and dining amenities. The Shenandoah Valley region is named for its Shenandoah River, which spans across much of the valley’s length. Though the exact origin of the word shenandoah is unknown, it is assumed to have been an Anglicization of several indigenous words, including the Iroquois term for “big meadow.” Several other legends surrounding the valley and river’s naming connect the term to an indigenous expression translating to “beautiful daughter of the stars” and to Iroquois Chiefs Sherando and Skenandoa. The valley, which is bordered by the Blue Ridge Mountain range, the Ridge-and-Valley Appalachian range, the Potomac River, and the James River, was first visited by European explorers in 1671 and soon settled through the use of the indigenous Great Wagon Road, which is now roughly paralleled by Interstate 81. During the American Civil War, the valley was of strategic importance to the Confederate Army as a backdoor route into Union sites in Maryland, Pennsylvania, and Washington, D.C. It has been immortalized in a number of films, television programs, and popular music songs, including the 1965 feature film Shenandoah and John Denver’s folk hit “Take Me Home, Country Roads.” In the late 20th century, the valley became a popular vineyard region, and in 1982, the 2.4-million-acre Shenandoah Valley American Viticultural Area was established. Today, the Shenandoah Valley spans eight counties in Virginia and two in West Virginia, with its cultural region extending to an additional five Virginia counties. The cities of Roanoke, Salem, Lexington, Covington, Buena Vista, Harrisonburg, Winchester, Staunton, and Waynesboro are located within the region, as well as the Massanutten Mountain range and the Page and Fort Valleys. Throughout the late 20th and early 21st centuries, the region has become a popular cultural tourist destination, offering a variety of outdoor recreational activities, scenic drives and trails, and retail and restaurant destinations. Outdoor recreation facilities within the valley include Shenandoah National Park, which was opened in 1935 and spans 200,000 acres near the Blue Ridge Mountains. The park is located 75 miles from Washington, D.C. and offers more than 500 acres of hiking trails, including 101 miles of the 2,181-mile-long Appalachian Trail public footpath, which is open for foot, bike, and backpacking traffic. Other National Park Service-administered sites within the region include the Harpers Ferry National Historical Park, which features a historic community with museums and restored buildings, and the George Washington and Jefferson National Forests, which offer 1.8 million acres of outdoor recreational activities, including hiking, swimming, camping, and horseback riding. 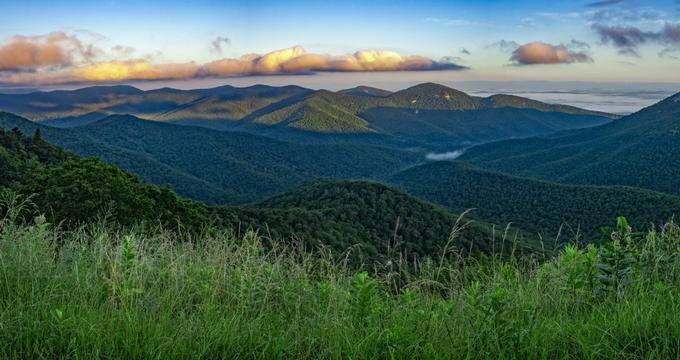 Scenic drives in the region include the famous Skyline Drive and Blue Ridge Parkway. Horseback riding is offered by Jordan Hollow Stables and Star B Stables, while group outdoor adventure experiences are offered by tour companies such as Front Royal Outdoors, Shenandoah River Adventures, and Wild GUYde Adventures. The region is also noted for its caverns and natural rock formations at sites such as Virginia’s Natural Bridge State Park and Grand, Luray, Skyline, and Shenandoah Caverns. Museums and cultural attractions within the region include the Museum of the Shenandoah Valley, the Strasburg Museum, the historic Belle Grove Plantation, and Thomas Jefferson’s Poplar Forest. A number of historic sites connected to the Civil War are showcased throughout the region, including New Market Battlefield Historic Park and the Virginia Museum of the Civil War. Family animal experiences are offered at Dinosaur Land, the Natural Bridge Zoological Park, and the Virginia Safari Park, while theatrical and music performances are presented at the American Shakespeare Center, the Wayne Theater and Ross Performing Arts Center, and the Shenandoah Summer Music Theater. A variety of shopping experiences are offered throughout the valley, including farmer’s markets at Showalter’s Orchard and Greenhouse, Shenandoah Heritage Market, and the Marker-Miller Orchards Farm Market and Bakery. Casual and fine dining is offered throughout the region’s cities, featuring traditional and international cuisines. A wide variety of award-winning breweries, wineries, and cideries are located throughout the region, including Peaks of Otter Winery, Pale Fire Brewing Company, and Old Hill Cider. Lodging options include hotels, motels, historic bed-and-breakfast facilities, and RV and campground sites. Annual events hosted throughout the region include the Shenandoah Apple Blossom Festival, which features more than 40 individual events including band competitions, parades, carnivals, and a 10K race. The Virginia Wine and Craft Festival offers wine tastings, live music and entertainment, and more than 100 arts and crafts vendors, while the Mountain Heritage Arts and Crafts Festival showcases the works of more than 200 local artisans. Other special events include a Wildflower Weekend and Youth Art Contest, a Shenandoah Antiques Expo, and the annual ValleyFest Beer and Wine Festival.